Every character in Citadels has a unique special power. You may use your character's power once at any point during your turn; however, you are never required to use a special power should you choose not to. Each character's power is summarized on its card and is detailed over the next few pages. Note: Characters who receive income for certain types of districts in their cities (the King, Emperor, Bishop, Abbot, Merchant, Warlord, and Diplomat) may use their power to receive this gold at any point in their turn. Thus you may choose to receive your income either before building new districts (if you need the gold in order to build the districts), or after building new districts (to gain income from the newly built district). You cannot, however, do both. Announce the title of another character that you wish to murder. The player who has the murdered character must say nothing, and must remain silent when the murdered character is called upon to take his turn. The murdered character misses his entire turn. Announce the title of a character from whom you wish to steal. When the player who has that character is called upon to take his turn, you first take all of his gold. You may not steal from the Assassin or the Assassin's target. Exchange your entire hand of cards (not the cards in your city) with the hand of another player (this applies even if you have no cards in your hand, in which case you simply take the other player's cards). Place any number of cards from your hand facedown at the bottom of the District Deck, and then draw an equal number of cards from the top of the District Deck. You receive one gold for each noble (yellow) district in your city. When the King is called, you immediately receive the Crown. You now call the characters, and you will be the first player to choose your character during the next round. If there is no King during the next round, you keep the Crown. If you are murdered, you skip your turn like any other character. Nevertheless, after the last player has played his turn, when it becomes known that you had the murdered King's character card, you take the Crown (as the King's heir). You receive one gold for each religious (blue) district in your city. Your districts may not be destroyed/exchanged by the Warlord/Diplomat. You receive one gold for each trade (green) district in your city. After you take an action, you receive one additional gold. After you take an action, you draw two additional district cards and put both in your hand. You may build up to three districts during your turn. You receive one gold for each military (red) district in your city. At the end of your turn, you may destroy one district of your choice by paying a number of gold equal to one less than the cost of the district. Thus, you may destroy a cost one district for free, a cost two district for one gold, or a cost six district for five gold, etc. You may destroy one of your own districts. You may not, however, destroy a district in a city that is already completed by having eight districts (or seven districts when the Bell Tower is in play). After you take an action, announce the title of another character who you wish to bewitch, and then immediately end your turn. When the bewitched character is called upon, its player must show his character card, take an action, and then immediately end his turn. The bewitched character cannot use his character's ability before you take over. 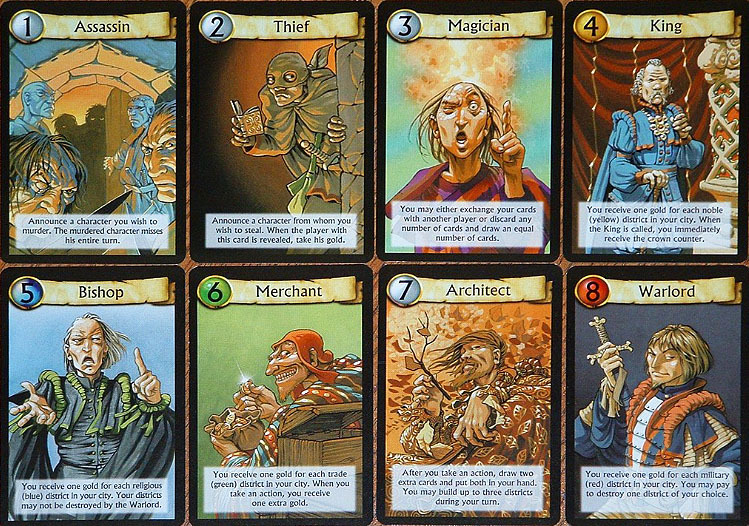 You now resume this player's turn as if you were playing the bewitched character, using all the character's powers in your city (e.g., the Merchant's gold bonus, the Bishop's protection from Warlord attack, the Architect's two card bonus, etc).. You still build districts from your hand of cards and pay with your gold (including taxes). If the King is bewitched, the King player still receives the Crown marker. If the bewitched character is not in play, you do not resume your turn. The Thief cannot steal from the Witch or the bewitched character. Whenever another player builds one or more districts in his city, that player must, at the end of his turn, give you one gold (if he has any gold left). 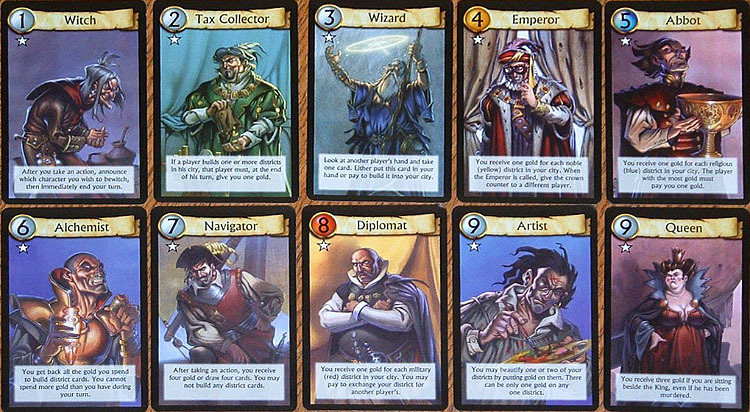 If the Assassin has already built a district card this round, his player must pay you one gold when you reveal the Tax Collector. You may look at another player's hand of cards and take one card. You may then either put this card into your hand or pay to build it in your city. If you build it in your city, it does not count towards the one district building limit, which means you can build another district as well. During this turn, you may build district cards identical to another district already in your city. You receive one gold for each noble (yellow) district in your city. When the Emperor is called, you immediately take the Crown from the player who has it and give it to a different player (but not yourself). The player who receives the Crown chooses to give you either one gold or one district card from his hand. If the player has neither, he does not have to give you anything. If the Emperor is murdered, the Crown stays where it is. (Note that, like the King, the Emperor may not be in the faceup discarded character cards). You receive one gold for each religious (blue) district in your city. The player with the most gold must give you one gold. If there is a tie for the player with the most gold, or if you have the most gold, then you do not receive the gold. At the end of your turn, you receive back all the gold you spent to build district cards this turn, but not the gold you spent for other reasons (paying the Tax Collector, for example). You cannot spend more gold than you have during your turn. After taking your action, you may either receive an additional four gold or draw an additional four cards. You cannot build any district cards this round. You receive one gold for each military (red) district in your city. At the end of your turn, you may take a district from another player's city in exchange for a district in your city. If the district you take has a higher cost than the district you give, you must pay the difference in gold to the player with whom you make the exchange. You may not exchange the Keep district, any districts in the Bishop's city, or any districts in a completed city of eight districts (seven with the Bell Tower in play). Note: If you are using the Diplomat in your game, you must remove the Cemetery from the deck since both cannot be used together. You may "beautify" one or two of your districts by placing one gold on each of the districts you are beautifying. The value of a beautified district (and therefore the cost of destroying or exchanging it) is increased by one. Beautifying also increases the number of points you receive for the district at the end of the game. There can be only one gold piece on any one district. You receive three gold if you are sitting next to the King (or the Emperor). If the King has been murdered, but was sitting beside you, you receive three gold when this becomes known (that is, immediately after your turn). Remember, this special power is tied to the King/Emperor card, not the Crown marker. Note: Do not use the Queen in a game with fewer than five players.